A sweet flan is one impressive dessert that always wows the guests. 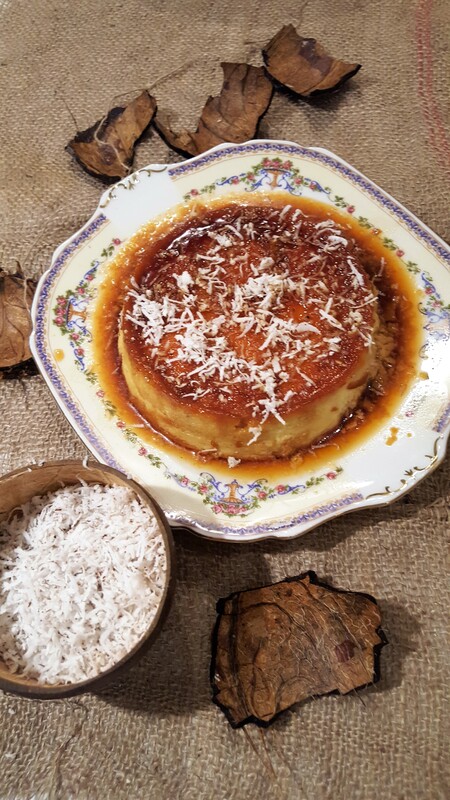 A delicious sweet custard flan that in my opinion everyone will love. With a good drizzle of caramel sauce that oozes from the bottom and spread all over the flan, giving that glossy golden outer layer of sweet slightly burnt toffee goodness. As it is the festive season, deciding on food menu to please all can be a little overwhelming. Why not try this super duper easy dessert to please everyone – let’s get the tropical flavours to this delicious dessert. This is a quick and easy baked flan recipe, put together in no time. It is great served warm or cold with a good spoonful of the caramel sugar on top. Flan has always been one of my mother’s favourite desserts. At every family get together or special occasions, mum first choice of dessert would be a flan. And we used to say “oh no not again!! !”, but quite honestly it remains one of the favourite sweets, one that disappears very quickly. 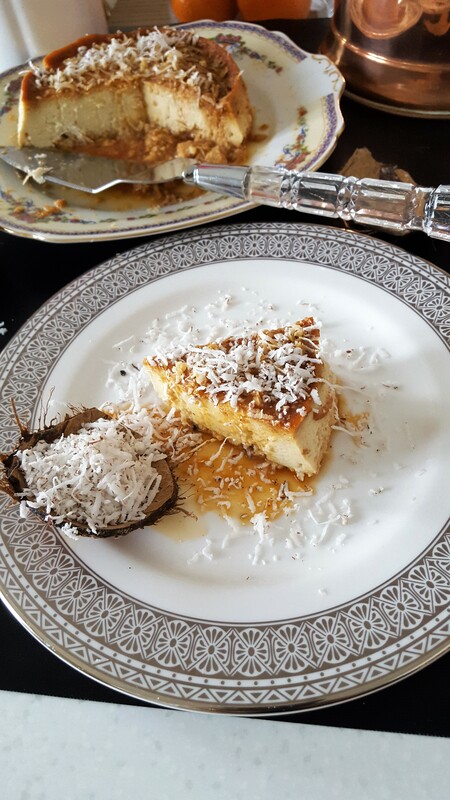 To add to this decadent dessert, I have added lots of freshly grated coconut and cardamom. A good handful of freshly grated coconut. In a medium saucepan over medium-low heat, melt sugar until it has dissolved and is golden in colour. Carefully pour hot caramel syrup into a 23cm round glass baking dish, turning the dish to evenly coat the bottom and sides. Scatter a layer of grated coconut and set aside. In a large bowl, beat eggs. Mix in the milk, sugar, cardamom powder and eggs. Whisk all together, add some more grated coconut. Pour egg mixture into baking dish. Cover with foil. Leave to cool completely. Refrigerate overnight. To unmold, run a knife around edges and invert onto a large rimmed serving platter. 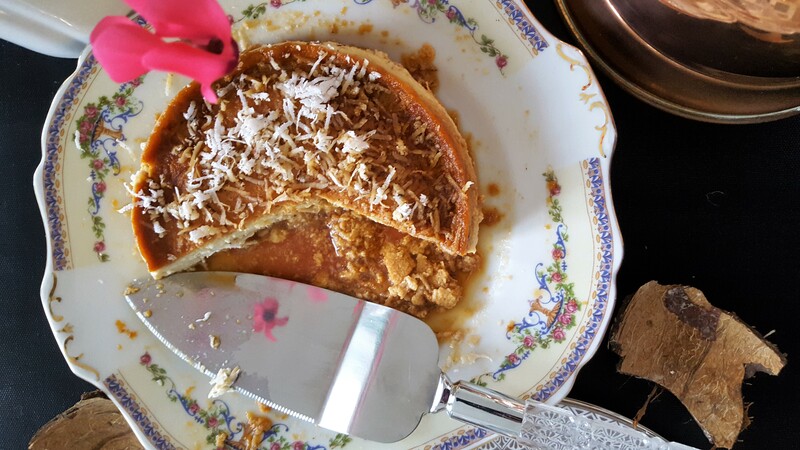 Carefully turn the flan out onto a dessert plate. Pour any of the caramel sauce that’s in the bottom of the dish over the top.